Adam & Andrea Shirey: Why have two dressers when one will do? Why have two dressers when one will do? In my ever-ongoing quest to get rid of stuff we don't need, I scored big by consolidating Andrea's and my clothes into my dresser. 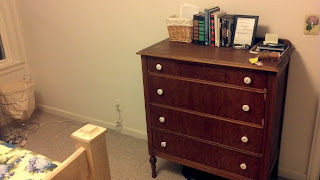 Tomorrow, we'll see if we can't sell Andrea's old dresser at an all-neighborhood garage sale here in Fremont tomorrow. One lonely dresser, sans partner. What used to hold only my clothes now stores them in the top two drawers (the first of which is only about half-height). 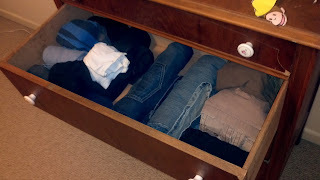 Andrea's clothes sit comfortably in the lower drawers. "How could you reduce necessary clothing storage volume by half?" you ask? In small part by purging unneeded clothes, but I think in larger part, it was the use of a handy-dandy trick I learned several years ago for packing clothes for travelling: roll them up. There are also plenty of videos showing interesting ways to do so (for example). The disembodied head of Curious George approves. Through a goodly amount of evenings organizing, purging items and subsequent trips to Goodwill, we've eliminated much of the stuff that occupied our 1400 square foot rental. The basement is largely empty, save for a few toys, my moderately sparse office and a few shelves of items in the storage room. Yet there are still more cows to release. Where do you want to go toda^Wnext week? Caterpillar is with an "a", not an "e"